Harsh drought conditions in parts of the American West are pushing wild horses to the brink and spurring extreme measures to protect them. 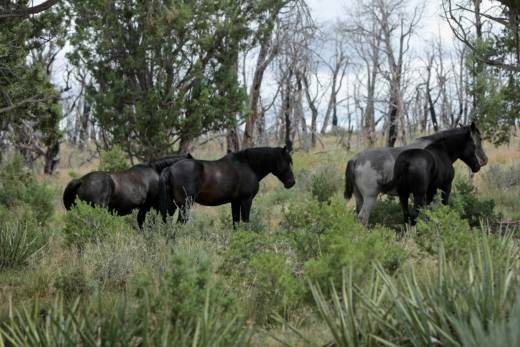 “We’ve never seen it like this,” said Simone Netherlands, president of the Arizona-based Salt River Wild Horse Management Group. In May, dozens of horses were found dead on the edge of a dried-up watering hole in northeastern Arizona. As spring turned to summer, drought conditions turned from bad to worse, Netherlands said. Parts of Utah, Colorado, Arizona and New Mexico are under the most severe category of drought, though extreme conditions are present from California to Missouri, government analysts say. Parts of the region have witnessed some of the driest conditions on record, amid a cycle of high temperatures and low snowmelt that appears to be getting worse, National Weather Service hydrologist Brian McInerney said. The dry conditions have fed wildfires that have destroyed hundreds of buildings across the West. This month, a firefighter was killed battling a blaze near California’s Yosemite National Park. The federal Bureau of Land Management — which oversees vast expanses of public land, mostly in the West — says the problem facing wild horses stems from overpopulation aggravated by severe drought. The region is home to roughly 67,000 wild horses. The agency’s emergency roundup in western Utah began a week ago, aiming to remove roughly 250 wild horses from a population of approximately 670. The operation is expected to take several weeks. Once the horses are rounded up, the government gives them veterinary treatment and offers them for sale or adoption. Those that aren’t sold or adopted are transferred to privately contracted corrals and pastures for the long term. Volunteers are also taking action. Since late spring, Netherlands’s Salt River group has hauled hay to a dozen locations outside Phoenix to feed a herd of starving wild horses. Roughly 200 miles (320 kilometers) north, a couple near Gray Mountain, on the Navajo Nation, have spearheaded an effort to leave water and food for horses they say would die without human intervention. In western Colorado, volunteers say they’re preparing to bring up to 5,000 gallons (18,900 liters) of water per day to a herd of 750 desperate horses. “Springs are drying up that have never dried up,” said Cindy Wright, co-founder of Colorado conservation group Wild Horse Warriors for Sand Wash Basin. Horses in the area stalk the dry earth with their ribs exposed, desperate for a drop, she said. Wild horse advocates have balked at the Bureau of Land Management’s insistence that wild horse populations are too high. Critics say the agency is using dry conditions as a smoke screen to shrink horse populations in response to pressure from ranchers whose livestock compete with the horses for grazing land. The agency is prohibited from euthanizing the wild horses it rounds up, though President Donald Trump has proposed allowing the animals to be killed or sold for slaughter. Activists in Nevada held a rally last Tuesday at the bureau’s state headquarters in Reno to protest a planned roundup later this year. Associated Press writers Felicia Fonseca in Flagstaff, Arizona, and Scott Sonner in Reno, Nevada, contributed to this report.